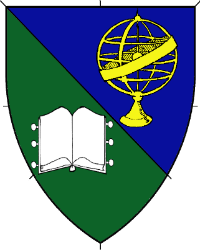 Per bend azure and vert, an armillary sphere Or and an open book argent. Name registered with the College of Arms in June 2013. Device registered with the College of Arms in July 2013.